HomeBlogInstagram Video vs Vine Video – Which Is Better For Your Brand? Instagram has video. Twitter has video. People love to watch and share videos. Brands already know that social media presence can significantly boost awareness. If you’re looking to gain serious online traction, which route should you take  Vine Video or Instagram Video? It’s no secret that share-ability is what brands are looking for with videos  and it looks like brands have already chosen Instagram as their vehicle. Twice as many top 100 brands use Instagram video as Vine. Keep in mind, Instagram video is only a few weeks old. So what are the biggest differences between the two video apps? Features  specifically filters. When Instagram was first making waves, a lot of it was focused around its filter feature  it made amateur photos look professional and all you had to do was, well, pick a filter. Instagram videos can get the same treatment, something Twitter videos don’t have. Instagram also boasts video stabilization to doctor any shaky recording, another feature Twitter can’t offer. Audience  specifically Facebook and Twitter. When it comes to brand awareness and reaching a large audience, social media is the easiest and most affordable way to do so  so which platform reaches the most people? Well Instagram (with 130 million monthly users) is owned by Facebook, which has more than 1 billion monthly active users. 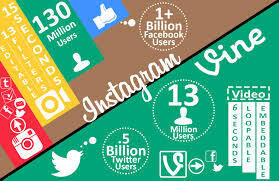 Vine has more than 13 million users and its big brother Twitter claims more than 200 million active Tweeters. While Instagram is its own platform, the fact that its content is so easily shared to both Facebook and Twitter can’t be ignored. Instagram also offers users the ability to pick which video frame will be set as the still thumbnail that will show up in Facebook’s newsfeed, something that is not possible with Vine videos. It may not seem like a big deal, but it’s these little details that make online content more visually appealing  and likely to be shared. Recording  specifically in the app itself. One thing both apps have in common is that (so far) you can only record and upload videos by recording them in the app. That does limit the content that you can share, since you’ve got to have the app open and be ready to shoot at any time. Time  specifically video length. Twitter has character limits for statuses and also a 6-second limit for video. Instagram videos also have a limit, but one that more than doubles that of Vine videos. At 15 seconds, an Instagram video has the potential to show a lot more content. Video length is probably the biggest key for marketers looking to build their brand in the online space. A 15-second video is comfortable for marketers  it’s the standard length of plenty online ads  ah, ads. Ads aren’t what most online users want to hear, or see, for that matter. That’s where Instagram has the advantage. Try creating a memorable marketing message in six seconds. It’s tough. Fifteen seconds offers brand managers a bit more breathing room. Instagram isn’t just a photo-sharing community  it stands out by helping users create more personal content that almost feels like flipping through a vintage photo album, all thanks to its signature filters palette. Instagram has this built-in cool factor and brands have to play by its rules. Just look at Lululemon, Maybelline, Michael Kors and Burberry. Their video clips feel less like ads and more like something one of your friends might upload  and that’s the key. More ambient sound and more natural settings means more shares. Another way to make your video share-able? Hashtags. Twitter used to have the market cornered on hashtags, but Facebook and Instagram support them too. Check out ‘So You Think You Can Dance’. They regularly splash hashtags on the screen to keep watchers involved in the conversation across multiple platforms. Making a video campaign on Instagram or Vine doesn’t have to cost anything, doesn’t have to have outstanding production quality, and it doesn’t even have to have dialogue. All you have to have is an acute awareness of what people want to see, or more importantly, don’t want to see. A video campaign on Instagram is more likely to cause a stir than on Twitter. It’s more share-able and gives a brand manager more options. Longer videos give brands more real estate to make a splash. Also, seamless integration with Facebook is hard to beat.